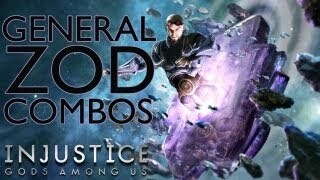 New General Zod combos have surfaced from GIACDOTCOM. Watch over five minutes of the Injustice: Gods Among Us lab work inside. GIACDOTCOM has posted some Injustice: Gods Among Us combos featuring the latest DLC character (at least for now), General Zod. Most Zod combos see Superman taking the tail whooping of a lifetime, and this one is no different. The uploader promises a "How-to" series for Zod in the future.